» Characters from DFW #8: CANDID JONES — by Monte Herridge. Characters from DFW #8: CANDID JONES — by Monte Herridge. #8. CANDID JONES, by Richard Sale. 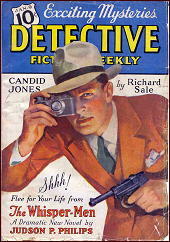 The series discussed this time is the Candid Jones series, created by Richard B. Sale and running from 1937-41. 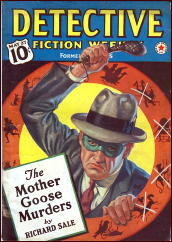 Sale had five other series running in Detective Fiction Weekly at one time or another: Daffy Dill, Captain McGrail, Casey Mason, John the Cobra, and Owl-Eye Venner. So Sale’s stories, from this evidence, seem to have been popular with the readers. The stories give a little background about Candid Jones and how he wound up as a photographer. His real first name is Terrence, and the Candid nickname was given to him because of his candid personality. He is a hardboiled character, and had quite a fearsome reputation as an investigator. Photography was his hobby at that time, and he began selling some of his pictures. He eventually decided to make a business of his hobby and went into business for himself, after resigning in 1932 from his insurance job of thirteen years. His background as an investigator helps him when he gets involved in mysteries, and his success brings more cases. His beginnings as a private investigator are seen in a flashback in the story “One Herring — Very Red”, in which he investigates the murder of a friend and mentor of his from that time period. At the end of this story he agrees to work for Apex Insurance Company on special assignments, otherwise he works on his photography jobs. And in another story, we learn of a previous marriage when he investigates a homicide and clears his ex-wife. However, he noted, eventually you have to use your fists or bullets if it becomes necessary. Another of Sales’ characters, on the other hand, Daffy Dill, is not really a hardboiled character but always carries a gun because he deals with criminals and crimes regularly. Dill is a much easier going person. Many series have a policeman as friend or antagonist to the main character, and this series has one. 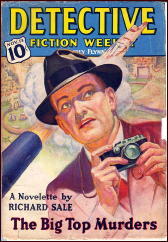 Inspector Harry Rentano is a friend of Candid Jones, and sometimes invites him along on his official investigations. Rentano is also available for any assistance Candid Jones may need on investigations he starts. Rentano first met Candid Jones during the time Jones worked as an insurance investigator. He used to be on the police Bomb Squad, and worked on some Mafia cases. He is currently head of the Homicide bureau, and was known as a policeman more interested in knowing the truth about a case than in making an important arrest to impress people. He is married with four children. The third member of the cast in the stories is Jones’ girlfriend, Claire Crossman. She is a model from the Frazier Agency, “and outside of being my favorite model, she’s about my favorite girl-friend too.” (Banshee) She often does not appear in a very prominent role in the stories, unlike Dinah Mason in the Daffy Dill series. Candid Jones has two items he seems to carry with him everywhere. One is a camera, often a Leica, Model G. The other is his gun, a German 9mm Luger. He does not say where he picked up this weapon, but it is possible he is a war veteran. One occasion where Jones used a different camera is in the story “You Can’t Print That!” where he takes an entire strip of twenty-four exposures with a robot camera that automatically takes the photographs and advances the film for the next exposure. It came in handy for the murder he witnessed, and left his other hand free to use his gun on the murderer. To get an idea of the sort of crimes that Candid Jones becomes involved in investigating, a short survey of some of the stories is in order. “Long Shot”, the first story, involves an attempt to fix a horse race. It is a very violent story, and probably the most hardboiled of the series. 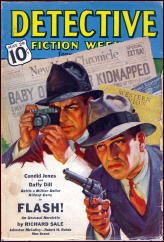 In “You Can’t Print That!” Jones witnesses a murder that is connected to the trial of a racketeer, and takes some photographs for his first newspaper job. In “Backstage” Jones makes a bet with Inspector Rentano that he can catch a double murderer by the next day. This one takes place at the local zoological park. In “Banshee” Inspector Rentano asks Jones for help on the question of a banshee at the city aquarium, and gets involved with some criminals. In “Make Way for a Dagger” Inspector Rentano asks Jones along on a murder investigation aboard a yacht in the Hudson River, where the weapon is a harpoon. Photographs play an important part in the stories in the series, often revealing clues and serving as evidence of crimes. Jones’ photograph studio is on Fifth near Forty-Fifth Street. The studio is evidently well-equipped, having been set up for modeling sessions that Jones photographs, plus an excellent darkroom for developing film. There was an extended gap between the last two stories. The last story, “Delayed Action” in 1941, explained that some changes had taken place since the previous group of stories. Jones noted that it had been almost a year since he had been involved in any crime cases, and he intended to continue that way. However, in this story he becomes involved in a crime case, and willingly so. He also notes that Claire Crossman has married someone else, so that romance is off. Candid Jones’ ex-wife plays a part in the story, and he protects her from the criminals. Inspector Rentano is mentioned in this story, but does not appear in it. The series is worthy of being reprinted. Although not quite as numerous and popular as the Daffy Dill series, it is a good hardboiled detective series worth reading. One advantage to writing these series overviews is being able to reread the stories, especially the better ones like Candid Jones. 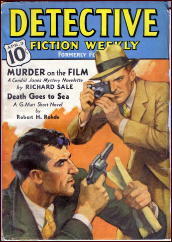 Richard Sale(1911-1993) went on to have quite a career in Hollywood and TV as a writer. Richard Sale was one of the better DFW writers. I hope Monte discusses Daffy Dill in a future article. That goes double for me. I hope someone reading this gets the right idea. PS. John the Cobra and Owl-Eye Venner are two characters I’ve never heard of. While I agree with you, Walker, that Daffy Dill is a must, I’d also like to learn more about these two. I’m familiar with Richar Sale’s series character The Cobra, which appeared in TEN DETECTIVE ACES for three stories. These tales have been reprinted by Altus Press in a Richard Sale collection titled THE COBRA. However, I don’t recall John The Cobra in DFW. Maybe Monte can tell us how many stories were in the series and the dates? Bravo, Monte! Sale was a fine writer and Jones was one of his better characters and your article does justice to both. I too would love to see all these stories in one book. I have already written a small portion of the Daffy Dill article, but I am not sure when I will get back to it. I have to reread a lot of stories to do that piece. Thanks for the lowdown on the John the Cobra series, Monte. I must never have read those issues. I’m sure I’d have remembered him if I had! I wonder if Doug Green can be persuaded to re-issue these stories for his Crippen and Landru line. Interesting to learn of yet another photographer detective whose camera work was intrinsic to the stories. I love that “robot camera” bit – an auto advancer is practically standard equipment these days for those of us who still take pictures the old fashioned way.